Happy New Year, apes. See you on the other side. "It's customary to end the year with a list of highs and lows. I often get asked to suggest names for these and usually pull a blank. This past year was no exception. 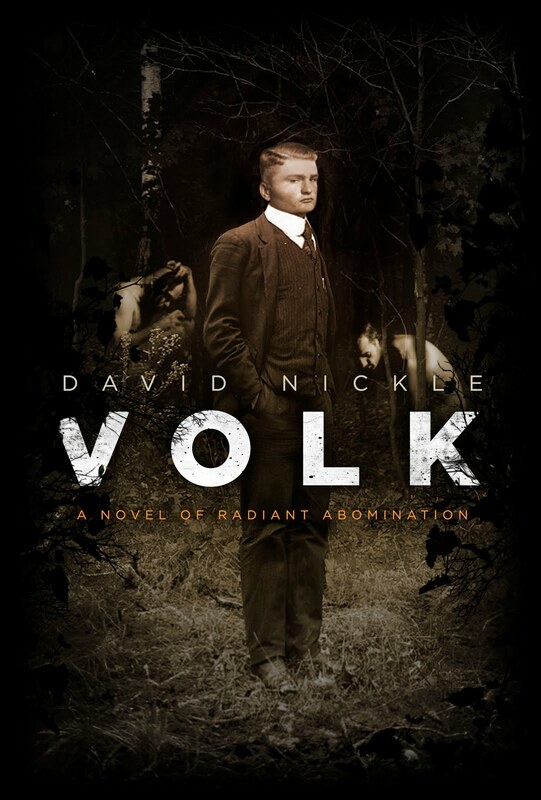 A couple of new books that stood out, however, were David Nickle's Monstrous Affections and Jason Guriel's Pure Product. An Honourable Mention list would include a half dozen others." Alex had written a very kind review of the collection in November's Quill & Quire - kind enough that he put a star beside it - so I knew he liked it. But liked it enough enough to make a Top Two list? Man. ... the second printing of Monstrous Affection ships. Last week, ChiZine honcho Brett Savory let me know that new copies of my ordered-out story collection were in Canadian distributor LPG's warehouse, and should be shipping to those who've ordered 'em Tuesday. Which means that Amazon.com, which has listed the book as 'vanished' for the past month or so, may well have some available for order. This will probably result in a bit of a plummet in the price of copies of the book advertised there from secondary sellers. As I type this, I note that one vendor is selling the thing for $111.48 (plus $3.99 shipping). As an author, I'm flattered at the price that this bookseller thinks he/she can fetch for a first-printing copy of my book. For a collector who wants a first-printing copy of Monstrous Affections - maybe $111.48 USD plus shipping is a fair price to pay. But if I were a shopper who doesn't put much stock in first printings and just wants the damn book in time for Christmas, I would be mighty ticked to have put down $111.48 USD, only to check back Tuesday and find the book available on Amazon for $14. I would have appreciated a tip-off. Well consider yourself tipped-off, American shoppers on Amazon.com. More MA's are on the way. Okay. Peter Watts is free right now (although that freedom could well be fleeting). And he is not a squid (although that is what his friends call him). Chris put the whole thing together himself, with no input or approval from Peter and only minimal consultation with me. I would buy him a beer for his troubles, but I'm not going to be in New York for the forseeable future all things considered... so it will have to wait. Much thanks, Chris. And once again: here's the link. Just heard last week from the folk at Pseudopod, that my story in Tesseracts Thirteen, "The Radejastians," will be adapted for podcast sometime soon. This will mark the third story of mine performed on the long-running weekly horror fiction podcast. To get a sense of how it might sound - go listen to the first two, "The Sloan Men" and "The Inevitability of Earth." It's been two days since we began fundraising for Canadian sf writer Peter Watts' legal defense - and the response from around the world has been staggering. The money that's come in to date will see Peter financially solvent through the first hump of this ordeal - so thank you, world - but we have no idea, still, how much he's going to need before he's free and clear. That means we're still at it. And still looking for that "more graceful" way to get money to Peter. Toward that end, Bakka Phoenix Science Fiction Bookstore manager Chris Szego has offered the store's mailing address, for the small but significant number of potential donors who are uneasy about using the PayPal online service and who would rather write a cheque. Folks in Toronto can also drop by with cash, and Chris or anyone else on staff there will make sure Peter gets the money. Now back to the response. It has been startling, both in terms of donations, and attention. Science fiction writer John McDaid has put together an excellent survey of who's writing about the incident - both mainstream media and blogging - right here. (Update December 14). There have been a lot of comments showing up on the various postings about this situation. I'm not weighing in on them - other than to repeat: send money to Peter Watts. But I am going to link to this one (that very eloquently sums it up), courtesy Robert Ashby (husband of sf writer Madeline Ashby) on her blog, right here. I got a detail wrong in the account I gave of Peter Watts' incarceration, in the post below. I had understood that he had been released from custody in Port Huron, wearing nothing but jeans and a denim shirt, during a snowstorm - then walked across the bridge to Canada. In fact, officials in Port Huron did transport him back to Canada before leaving him there, coat-less and without a vehicle, in a winter storm. Just learned this fact after talking with Peter again. I've sent the correction off to John Scalzi and Cory Doctorow. I have also posted it here. This posting might seem redundant coming as it does at 6 p.m. on Friday afternoon. But I honestly thought that waiting just four or five hours after putting the word out to Cory Doctorow and John Scalzi about my friend Peter Watts' nightmarish legal situation, I would still be timely in posting a plea for help. As it turns out, I am come late to the call for cash to pay for Peter's defense. And the love is flowing. Peter, a Canadian citizen, was on his way back to Canada after helping a friend move house to Nebraska over the weekend. He was stopped at the border crossing at Port Huron, Michigan by U.S. border police for a search of his rental vehicle. When Peter got out of the car and questioned the nature of the search, the gang of border guards subjected him to a beating, restrained him and pepper sprayed him. At the end of it, local police laid a felony charge of assault against a federal officer against Peter. On Wednesday, he posted bond and walked across the border to Canada in shirtsleeves (he was released by Port Huron officials with his car and possessions locked in impound, into a winter storm that evening). He's home safe. For now. But he has to go back to Michigan to face the charge brought against him. We drank tea and ate scones and sang Cthulhu Christmas carols and carried on like the risen dead at the Merril Collection - and as a final Christmas miracle, my laryngitic voice held out long enough to render a uniquely terrifying reading of "The Mayor Will Make A Brief Statement And Then Take Questions." As I said to the crowd before the reading, "I am deathly ill and delighted to be here, and that sentence doesn't come up in conversation very often." Seriously - it was a great time, and in a minute I'm going to craft a thank-you email to the Friends of the Merril Collection for having me and ChiZine honchos Brett Savory and Sandra Kasturi as guests yesterday at the afternoon tea. 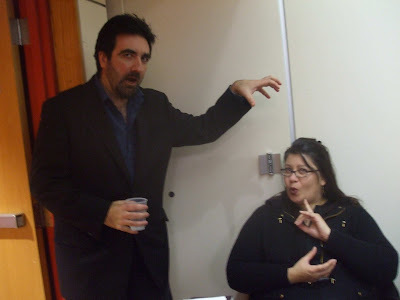 For now, here is a shot (courtesy of Yard Ape Do-Ming Lum) of Sandra Kasturi and I, acting out a scene from Nosferatu, in the original Silent. ... and we'll see how it goes, this Christmas Cream Tea reading. I spent the last couple of days battling laryngitis, and this morning have something resembling a voice. So I'm going to try and read a short story in such a way that won't ruin everybody's Christmas and start a run on returns for the story collection. Wish me luck, yard-apes. In the meantime, however, I note that the Advent Book Blog has posted my review/pitch of Albert Sanchez Pinol's brilliant novel Pandora in the Congo. It was supposed to be 25 words or less. I seem to have gone a little longer -- by, um, a factor of 10. But that's because it's a good and complex book, and saying, Brits Battle Mole Men, Bed Mole Woman, wouldn't do it justice. The editors have indulged me, and it's right here. Best short story collection: Monstrous Affections by David Nickle. The cover is creepy, tapping into that visceral reaction we have when the 'normal' is slightly twisted. The stories themselves are also very creepy, drawing you into believable, domestic worlds then showing you the blue pulsing intestines of those worlds. I have conveyed my gratitude privately - and now do so publicly. Inard-felt thanks, Kaaron! Also - for those in the United States and the UK wondering where in the world they can get a copy of Monstrous Affections and other fine ChiZine titles: the news is good. Yesterday, the ChiZine team announced a new distribution deal with Diamond Book Distributors, that will see the books sent far and wide. 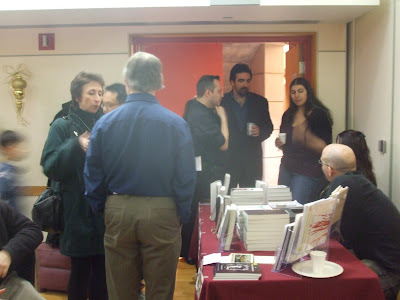 TORONTO, Ontario (November 29, 2009) – Building on its deal with the Literary Press Group and LitDistCo, ChiZine Publications (CZP) has signed a deal with Diamond Book Distributors to have its books placed in U.S. and U.K. bookstores. One of the U.S.'s leading distributors, Diamond distributes to booksellers like Barnes & Noble, Ingram, Baker & Taylor, WaldenBooks, and Borders. It represents a number of book and comic publishers, including Borderlands Press, Night Shade Books, Prime Books, Subterranean Press, and Random House UK. "It's another step forward, but a bigger risk," says CZP Co-Publisher Brett Alexander Savory. "Getting books on the shelves means getting those books printed. If they don't sell, we eat that cost. But our experiment with the Literary Press Group worked. Some of our books sold out. So if we're going to grow, we need to be in major markets like the U.S. and U.K."
The announcement comes on the heels of a lengthy article about ChiZine Publications that appeared in The National Post's Afterword literary blog. In the article, Brett, fellow Co-Publisher Sandra Kasturi, and authors David Nickle (Monstrous Affections) and Robert J. Wiersema (The World More Full of Weeping) discuss the origins of CZP and the challenges of being a "genre" publisher at a time when "genre" fiction is assumed to not be "literary" fiction. Brett says the plan is for CZP titles to be in U.S. and U.K. bookstores by early 2010. ChiZine Publications (CZP) is an independent publisher of weird, subtle, surreal and disturbing dark fiction. It is the book-length, print version outgrowth of ChiZine (www.chizine.com), an online professional market in operation since 1997 focused on the same type of story material. All of CZP’s publications are hand-picked by co-Publishers and Bram Stoker Award-winners Brett Alexander Savory and Sandra Kasturi. Erik Mohr serves as cover artist and graphic designer, with publicity by Matthew Moore. Diamond Book Distributors is a division of Diamond Comic Distributors, Inc., and is dedicated to making a wide selection of graphic novels and other pop culture collectibles available to the mainstream book market. For more information, visit Diamond Books on the web at www.diamondbookdistributors.com. A show of affection from the Black Quill .. I just found out yesterderday that Monstrous Affections is on the ballot for the 2009 Black Quill Awards. It is up for a prize in the category of Best Dark Genre Fiction Collection, alongside collections from Dennis Cooper, Robert Dunbar, Tom Cardamone and James Currier. This award, sponsored by Dark Scribe Magazine, is a young one: it's only the third time out. In the necessarily recent past, it's honored folks like Sarah Langan and Joe Hill (and his dad Steve), John R. Little and Tim Lebbon. This year, it's cast its net to the work of Dan Simmons, Ellen Datlow, Brian Keene and others. Bottom line: I'm well-stoked to see my name in shadows - particularly such shadows as these - on this list. Which you can read for yourself, right here.